Polished Copper, Urethane, and Wood Finials. 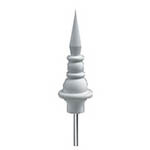 Endless decorative possibilities from rooftop decor to flag pole toppers to bed posts. Designed for exterior use. These Light-weight and beautiful accents are moisture, bug, and crack resistant. Polished Copper with a Brass Stem. Includes a steel mounting rod with a black powder-coated finish. 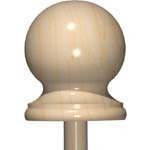 60 Series: 1/2" dowel base. 50 Series: 3/4" dowl base.